We are falling short of words to describe Aishwarya Rai Bachchan‘s red carpet appearance at Cannes Film Festival 2017, but lets try. It was always said that the actress will make heads turn with her red carpet look tonight, but it becomes impossible to take our eyes off her. 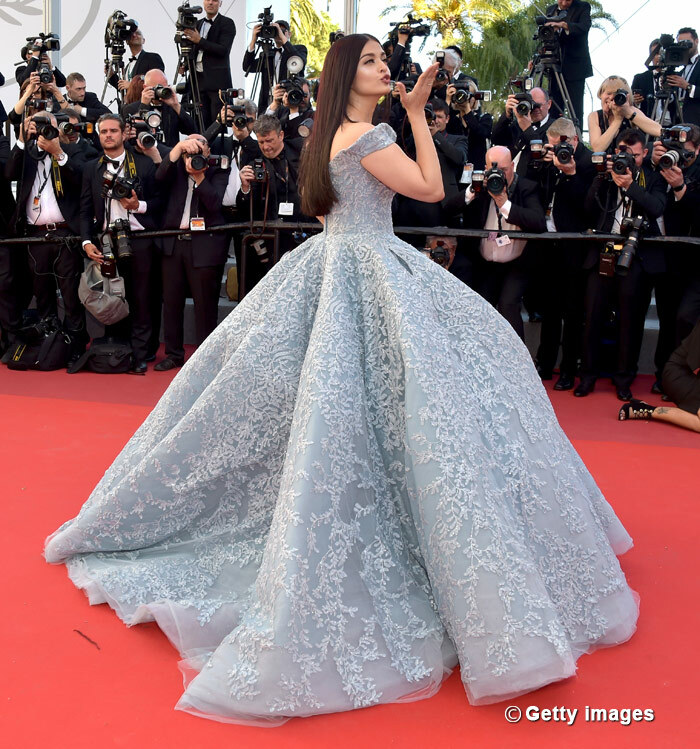 Wearing a blue Michael Cinco gown that was paired with Ferragamo shoes and Boucheron jewelry, Aishwarya didn’t just walk the red carpet of the coveted fest, she set it on fire. She stepped on the red carpet, posed for the photographers, did her iconic flying kiss, along with a namaste and walked the stairs and she slayed it without even trying it. Aishwarya, who is a Cannes veteran first walked the stairs of the coveted film fest back in 2002 when she presented her film, Devdas at the fest. At that time, her co-star Shah Rukh Khan and Sanjay Leela Bhansali, who directed the film also walked the red carpet with her. Incidentally, this year, Aishwarya will present Devdas yet again at Cannes Film Festival as a part of the L’Oréal Paris Open Air Cinema that is scheduled to take place tomorrow. Coming back to her red carpet look, this was a gown from Michael Cinco’s Fall-Winter 2017 collection named The Impalpable Dream of VERSAILLES. It is inspired by palaces of Versailles. Needless to say that there has never been a more perfect red carpet moment than this. Next Movie Review: Saba Qamar’s Hindi Medium has stunned fans in India!